Washington, DC (LifeNews.com) -- "The Gallup released the results of a new survey confirming, for the third time in the last year, that more Americans call themselves pro-life than "pro-choice" on abortion. 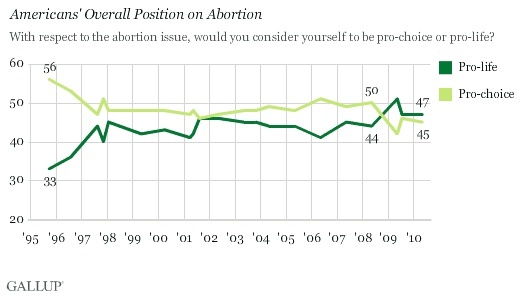 That's enough for the respected polling firm to say a pro-life majority is the "new normal" in the United States. According to a May 3-6 Gallup poll, 47 percent of Americans say they are pro-life on abortion versus 45 percent who say they are "pro-choice," supporting legal abortions..."
"Because this is the third consecutive time Gallup has found more Americans taking the pro-life position, the polling firm calls the results "a real change in public opinion."" If you click on this link you'll see various graphs that show the divide between the Pro-Death camp and Pro-Lifers broken down by age and political party, along with lots of other information worth reading. I still wish more Democrats and Liberals would get on board though. How is it any less bad to kill a baby than a condemned criminal?